What’s Inside A Plumber’s Toolbox? Looking to tackle a few simple plumbing projects or repairs on your own? Even if you’re new to plumbing, you can still repair leaks and clean out a clogged drain or toilet with just a few simple tools. Check out this list of six essential tools every plumber — both professional and amateur alike — needs to get the job done. Augers are a plumber’s best friend when it comes to cleaning out clogged sinks or toilets. A sink auger — also called a drum or canister auger — has a flexible cable wound into a drum canister with a coiled steel auger bit on the other end. When the canister is turned, the cable and bit are turned too and the auger lowers into the drain. A toilet or closet auger has a specialized design to clean out toilets and should not be used on sinks. Similarly, the sink auger shouldn’t be used for toilets. The power of a good plunger can’t be underestimated. A flange plunger (also called a ball plunger) has a special ball shape that forms a strong seal with the toilet bowl and creates a vacuum-like force to clean out clogs. More commonly, the cup plunger has a rubber cup shape and wooden handle ideal for cleaning clogs in sinks, showers or bathtubs. The cup plunger is less effective for toilets. A quick and easy way to fix leaks, Teflon Tape is a toolbox essential. This thin white tape is inexpensive, easy to find and incredibly versatile. It’s perfect for sealing pipe threads at plumbing joint connections like shower heads and threaded line connections. One of the most important tools in any toolbox, an adjustable pipe wrench is especially important for plumbing repair. This wrench should provide plenty of grip and leverage when tightened around any pipe. With a sturdy knob for adjustments and serrated teeth, this wrench will increase the pressure even more as you turn it. The wrench does leave marks on the pipes, however. If you don’t want to damage the pipes, or plan to use the wrench for visible repairs, putting duct tape over the teeth can help protect against marks. For more complicated projects that require you to replace a section of pipe, pipe benders can help make sure that your pipe fits within whatever space requirements you have. For smaller jobs, a hand conduit bender can do the trick. But for larger jobs, a hydraulic pipe bender is necessary to get your pipe bent to the required shape and size. Also good to have for more complicated jobs — or any job with copper pipes — a tube cutter will help you cut smooth and square ends that fit securely with any new or pre-existing joints. With copper pipes especially, this accuracy is important. Although tube cutters typically leave small burrs on the edge of the cut, you can easily remove them with a file or de-burring tool. 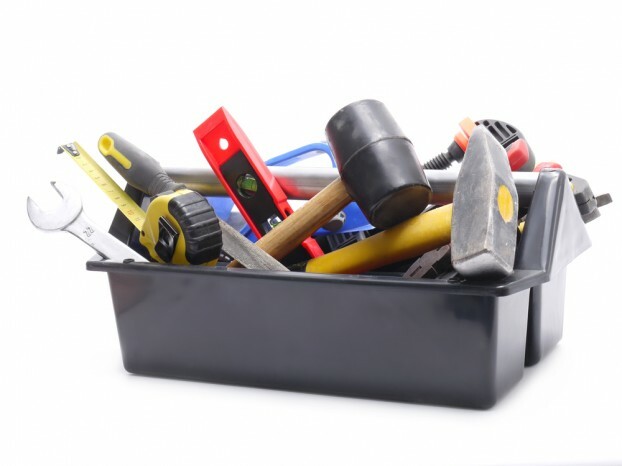 With these tools, you can complete most simple plumbing repair projects in your home. Remember to always stay safe, wear protective glasses and keep other toolbox essentials like hammers and pliers nearby just in case. If the project becomes more difficult or dangerous than you anticipated, never be afraid or embarrassed to call a professional to help you avoid further damaging your plumbing.